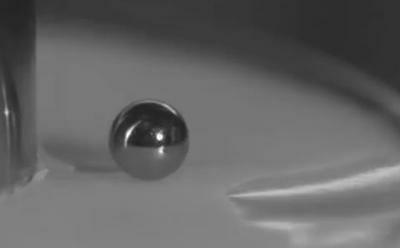 A small steel sphere sits on a shear-jammed suspension just as it would on an ordinary solid. New research has identified how liquid-like materials can change into a solid-like state without the addition of extra particles or changes in volume. Liquid-like materials with particles in, known as dense suspensions, are found in the food industry (for example molten chocolate) and clay deposits on the bottom of oceans or rivers. Understanding the ‘jamming transition’ - when such a system behaves like a solid (if you want to build something on it) or when it flows (important if you want to process it) - could help in the design of new materials that actively use this transition from fluid-like to solid-like behaviour. The study, published in Nature, was led by Dr Ivo Peters, Lecturer in the Aerodynamics and Flight Mechanics Research Group at the University of Southampton. Ivo, who conducted the work while working at the University of Chicago, said: “Add more cars to traffic or more particles to a liquid and the result is a sudden transformation in behaviour from liquid-like flowing to solid-like jammed. We found a second route to jamming that might appear highly counter-intuitive: solidification without addition of extra particles or changes in volume, but instead triggered by stirring. The concept of “jamming by shear” was introduced to explain how frictional fluid materials transition from a flowing to rigid state. So far, however, experimental evidence has been limited to two-dimensional granular systems and most investigations have been theoretical. This new research presents the first systematic experimental study of shear jamming in fully three-dimensional systems. The experiment was conducted by rotating a cylinder, partially submerged in a fluid mixture containing water, glycerol and cornstarch. The solid behaviour was demonstrated by dropping small (5 mm) spheres onto the continuously sheared material. As more shear was applied to the solution, the spheres’ trajectories changed from slowly sinking (unjammed) to re-bounding and remaining on the surface for as long as the shear-stress was applied (jammed). Ivo said: “Our findings extend shear jamming beyond dry granular materials and demonstrate its relevance to dense particle suspensions too. Both have their own state diagrams, and we have shown in a single experimental system how a state diagram can be constructed that is compatible with experiments and simulations in both fields.